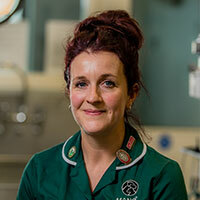 I studied at Hadlow College, qualifying as a veterinary nurse in 2003. I completed work experience at Manor and having always had my own pets registered with the practice. I was delighted to be given the opportunity to train and work at the surgery. My main area of interest is cat behaviour, and I am the practice's dedicated "Cat Advocate", ensuring we maintain our Cat Friendly Clinic status and training all new staff in our cat handling and care protocols. At home I have two cats, three dogs, a menagerie of rabbits, guinea pigs, quails and a pony!